Studio Athletica - Downtown Toronto elbow physiotherapy - Call Now. Below you will find a list of symptoms and conditions that we see with our Downtown Toronto elbow physiotherapy clientele. At Studio Athletica, we specialize in several different services that can help treat your health problems. Please feel free to read more about your symptoms, conditions and our suggested treatments, or contact us to pinpoint the best treatment to heal your body. The downtown Toronto elbow physiotherapy program is the gold standard. Our Downtown Toronto elbow physiotherapy program sees a lot of tennis elbow. 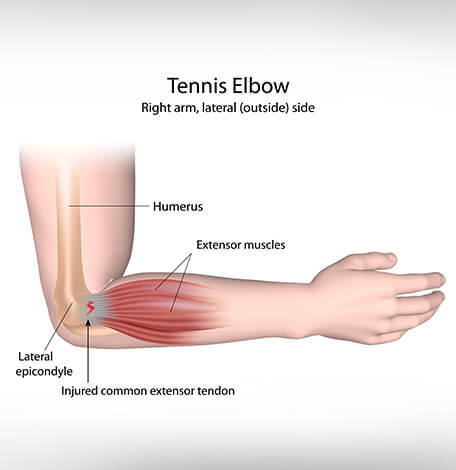 Tennis elbow, also known as a lateral epicondylitis, is a painful condition of the elbow caused by overuse. Playing tennis or other racquet sports can cause this condition. However, several other sports and activities can also put you at risk. It is an inflamm tenation of the tendons that join the forearm muscles on the outside of the elbow. The forearm muscles and tendons can become damaged from overuse such as repeating the same motions again and again. This leads to pain and tenderness on the outside of the elbow and a weak grip. Our Downtown Toronto elbow physiotherapy program sees a lot of golfer’s elbow. 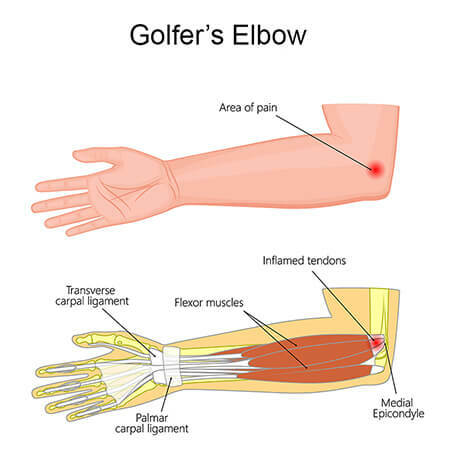 Golfer’s elbow is a simpler term for medial epicondylitis. 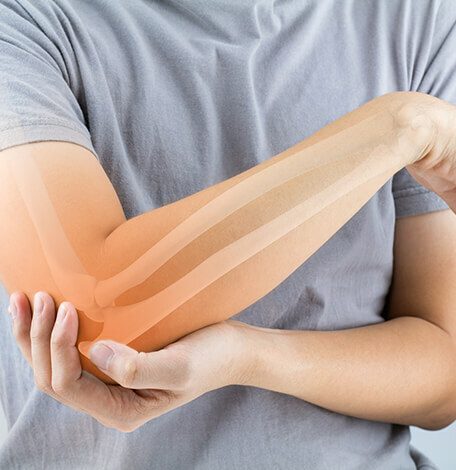 It can cause a great deal of pain and discomfort in the area where the tendons connect the forearm to the elbow. The pain will will be concentrated on your elbow and can travel into the forearm. This type of injury is likely caused by overuse causing minor tears in the tendons. Similar to the name, Golfer’s elbow will affect the muscles in the forearm, the same muscles that are used to flex, swing, and grip. It isn’t limited to golfers. Any activity that involves repeated forearm motions including the hands and wrists can cause golfer’s elbow such as painting and carpentry. 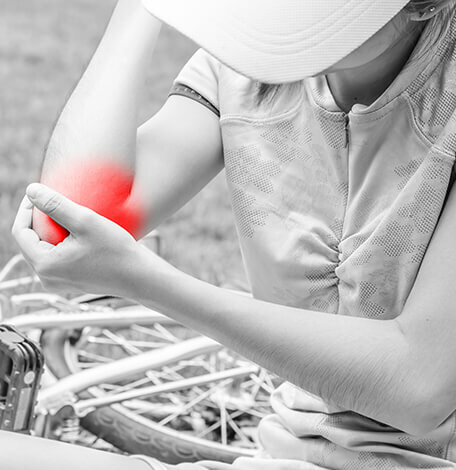 Golfer’s Elbow is characterized by pain and tenderness on the inner side of the elbow, sometimes extending into the inner side of your forearm. You may also feel stiffness and it may hurt to clench your fist. Weakness in the hands and wrists is also common, including numbness and tingling sensations. Our Downtown Toronto elbow physiotherapy program sees a lot of elbow sprains. An elbow sprain happens when the ligaments in the elbow is torn, twisted, or stretched. Most elbow sprains happen after a direct hit or fall onto the elbow, also when the elbow is twisted in a motion that is unnatural. This can occur during a fall, during contact sports, weight training, and during accidents or collisions. Elbow sprains will cause pain the area, including swelling, bruising, and tenderness. Some people experience muscle spasms as well as the joint becomes unstable. The severity of symptoms will depend on the severity of the ligament damage. More severe sprains can result in joint instability and dislocation or immobility. Our Downtown Toronto elbow physiotherapy program sees a lot of biceps/triceps tears. Trauma, injury, and repetitive use are responsible for the majority of arm and shoulder injuries and the most serious of these is when the biceps tendon is completely torn. Most commonly, the biceps tendon tears at the shoulder. Biceps/Tricep tears are likely in people who perform repetitive overhead lifting and in athletes who lift weights, participate in aggressive contact sports, or with age due to chronic wear of the biceps tendon. 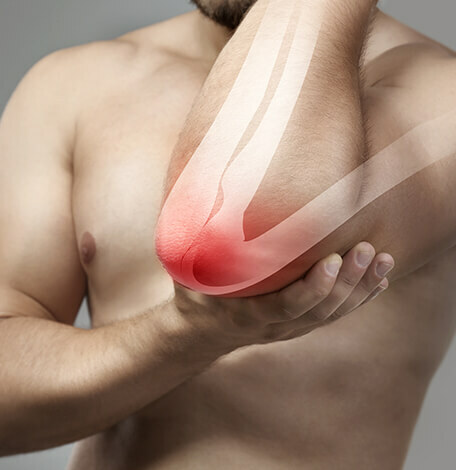 Symptoms of a bicep/tricep tear includes: a sharp pain in the upper arm or elbow, bruising, swelling, popping sound when moving shoulder, tenderness, muscle spasms, weakness, and a bulge or deformity in the lower part of the arm. Our Downtown Toronto elbow physiotherapy program sees a lot of cubital tunnel syndrome. The cubital tunnel is located in the elbow and is a narrow passageway between the bones and tissue. Cubital tunnel syndrome is the effect of pressure on the ulnar nerve, one of the main nerves of the hand. It can result in a variety of problems, including pain, swelling, weakness or clumsiness of the hand and tingling or numbness of the ring and small fingers. It can cause a considerable amount of discomfort in people who suffer from this syndrome and may, in severe cases, lead to a loss of function of the hand. 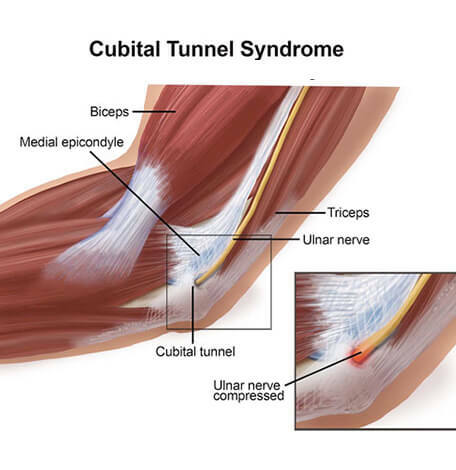 Some risk factors for Cubital Tunnel Syndrome are repetitive flexion, extension, overhead throwing, joint inflammation, arthritis, as well as other occupational or athletic factors. Symptoms will feel like weakness in the fingers, difficulties pinching the thumb and little finger together, difficulties gripping, and deformities in the shape of your hand in a claw-like form.